So, having rescued my poor old R85 A1 that I bought a few years ago and lobbed in a garage after it was firing out with little no compression at all. A few hours in the hands of Mike (RR01) and she's now working flawlessly at 348 FPS. Anyway, I had purchased an Ares SUSAT, and despite it being designed for a smaller rail than the R85 comes with, I hammered it on (literally). Regrettably, all this hammering has "reduced the efficiency" of the left/ right and up/down adjusters, the bolts that hold it on and its generally a bit broke...but working! So, went to have an aim with it fitted securely to the weapon the other week, and Jesus...the Eye Relief is so poor I can't see a darn thing with glasses on. So, I am searching for an alternative. I am thinking get one of the rail adapters to fit a 20mm rail on and get a new Optic. The options are limited to, in my view, Elcan Spectre's and ACOG's. I am not after a complete military replica with trades and all that lark, I just want solid eye relief, 4X Magnification and windage, elevation adjustment to at least be reasonable. I appreciate that no Airsoft Replica will ever be close to the quality of a RS one, but there are so many of both Elcan's and ACOG's out there I don't know whats good and whats not! Ideally, I want an Elcan Spectre, but am happy to take any suggestions on board. In short, which is the best Elcan and where should I buy it from? Been looking for hours and can't make up my mind, so thought I would ask here, you guys no best! Not sure about best elcan as I've only used two of the 3 different ones. The second one I used was a while ago and was the 1-4x one. Not the new g&g one but another (probably china made one) in short it was ok but not worth the money. The 1x was actually more like 0.75x and the 4x was more like 2x. Eye relief wasn't great either. The one I linked to is the one I'd go for given the chance- though I'd like to see the G&G first to see how it is. There are a few different variations of it too, including one that comes without the docter sight, as well as one that comes in Dark Earth instead of black. Excellent quality, very crisp sight picture, eye relief is far better than those SUSAT replicas, the lenses can take BB hits from sub 25m and the red dot is, for airsoft ranges anyway, practically parallax free. Well, frustratingly I guess I have heard that the G&G one is an excellent piece of kit, however the cheapest I have seen it from UK Retailers is £150. I am tempted to take the punt on it, if it turns out to be as good as is claimed its not a bad investment, however it remains that it could be a lot cheaper to get on in from abroad, particularly HK. Though, again, the linked Spectre from the first post is just another option, and a well priced one at that. Surely the G&G offering cant justify the extra outlay? You could see what ProAirsoft have to offer, as they are the UK G&G stockist. They do owe you a favour!! For me the G&G having the proper variable zoom is enough for it to be worth the extra cost. It's just that I can't afford it lol. The ACOG I have came to around £100 with shipping and everything from RSOV in HK. Though I bought the one with the standard Picatinny rail mount because I already had the L85 raiser rail. 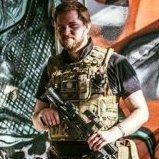 I may well have to send ProAirsoft a cheeky email, mind you, their customer service has been pretty damn good, can't argue with that in the slightest. As for the variable zoom on the G&G, is it really that big a deal? All it will do is tunnel vision you like mad, and if you are close enough to not be able to use 4X Zoom (Ie: Sub 10m or so)... The battle sights should suffice at that range anyway, its what they were designed for after all. As much as I like ACOG's, I can't stand the Riser rail, it is literally a last resort I think.